Are you having the ‘I just washed my hair yesterday… WHY does it look so greasy/dirty? !” battle with your locks? Well, don’t worry, you’re not alone. Salon Vanity is here to help you, help your hair and scalp! Of course, everyone knows how to wash their hair. Rinse, lather, repeat. But, are you paying attention to the ‘little’ details? When rinsing your hair, you should always use hot water. Doing so will open your hair cuticle, remove dirt and product that is trapped in the hair, and loosen up the oils in the scalp. Be sure to really scrub and massage the shampoo throughout the scalp and hair. When conditioning only apply to mid shaft to ends. NEVER at your root! Finally, rinse. Okay, so now I’m sure you’re asking ‘Great, that information was helpful- but very similar to my daily routine… Where am I going wrong?” Daily, my friend. That’s part of the problem. Your hair can become oily from over washing! The scalp has natural oils that keep it protected. If the natural oils are being continuously washed away, your sebaceous glands will kick in and over produce oils so that the scalp will not become dry. Now that you’re filled in on the ‘Why’, we’re going to give you the ‘How’ to fix this. It’s simple. You’re going to be your own personal hair trainer. Start by washing your hair every other day, then push it a little further and wash every 2 days. If you’re experiencing the oily look during your personal training, try using L’Oreal Professionnel’s Fresh Dust. This is a dry shampoo that will soak up that oil and keep your hair looking fresh and fabulous in between washes! 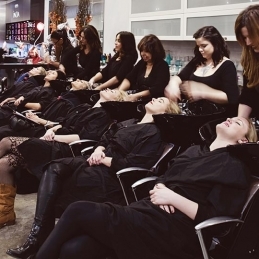 In short, Salon Vanity believes in hot water, personal hair training, and Fresh Dust dry shampoo!